Edward Madden, Coordinator of Public Outreach for Pace, talks to Hoffman Estates High School students about riding public trasportation during a “Hop on the Bus to Independence” workshop. Representatives from Pace Bus and JJs List, held a “Hop on the Bus” training at Hoffman Estates High School. 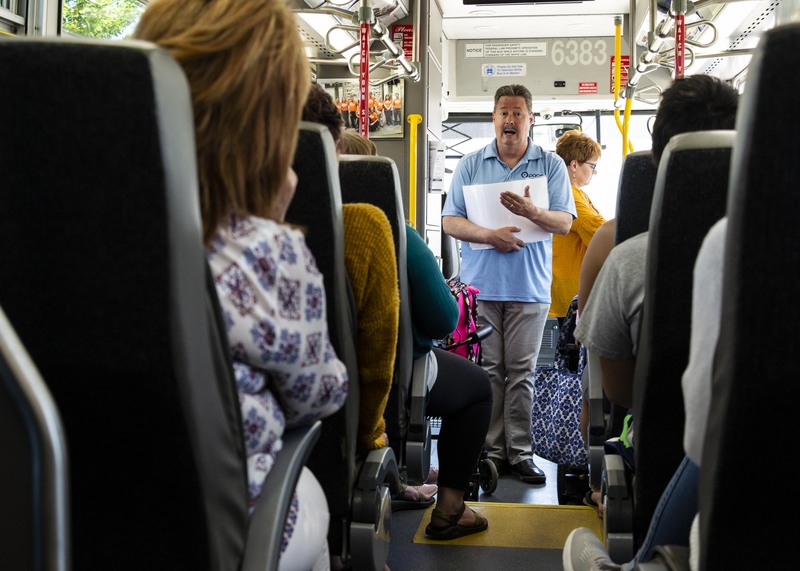 During the 90-minute session, students in Hoffman Estates High School’s special education department learned how to independently use public transportation. Hoffman Estates High School Speech Pathologist Maria Luciani said the program was an important part of teaching the students independence as well as giving them an ability to access the community. The program started with an overview of public transportation within the Chicagoland area. A JJs List representative walked students through accessing a variety of resources including bus and train schedules. After the classroom discussion, students walked out to a Pace bus in the school’s parking lot. At the bus, Madden, and other Pace representatives discussed details of bus operations and safety with the students.